Indulge in a unique combination of local flavours and cream for a deliciously rich dessert. Recipe and photo courtesy of CNIEL. Combine butter and icing sugar in an electric mixer bowl fitted with a paddle attachment. Process until well combined and add almond powder, eggs and flour. Process until well combined, cling wrap and keep refrigerated for at least one hour (preferably overnight). Roll the dough over 3 to 4mm thick, poke with roller docker. Arrange in 22cm diameter ring mould and bake 18 minutes at 170°C. Warm up half of the lychee puree with the gelatine. Add in the cold puree and mix well. Combine Italian meringue, whipped cream and lychee puree. Cast into tart shells and freeze. In a large saucepan, combine water and syrup. Bring to boil, add in roselle flower and bring to boil again. Take out from the heat, cool down and keep refrigerated in airtight jars covered with the syrup. In an electric mixer bowl fitted with whisk attachment, combine almond paste, pistachio paste and egg. Process until fluffy and fold in flour sifted with baking powder then, melted butter. Cast into a flexipat and bake 12 minutes at 180°C. Cut into 14cm diameter and freeze. Heat up half of the roselle puree with gelatine and sugar. Whisk in the other half of the puree and fold in whipped cream. Cast into 16 cm ring mould, push in the pain de Gênes and roselle jelly insert and freeze. In a saucepan, mix all the ingredients and bring to boil. Take out the pan from the heat, whisk in gelatine and cornstarch, then simmer for 3 minutes. Cool down to around 30°C then coat the roselle mousse insert. 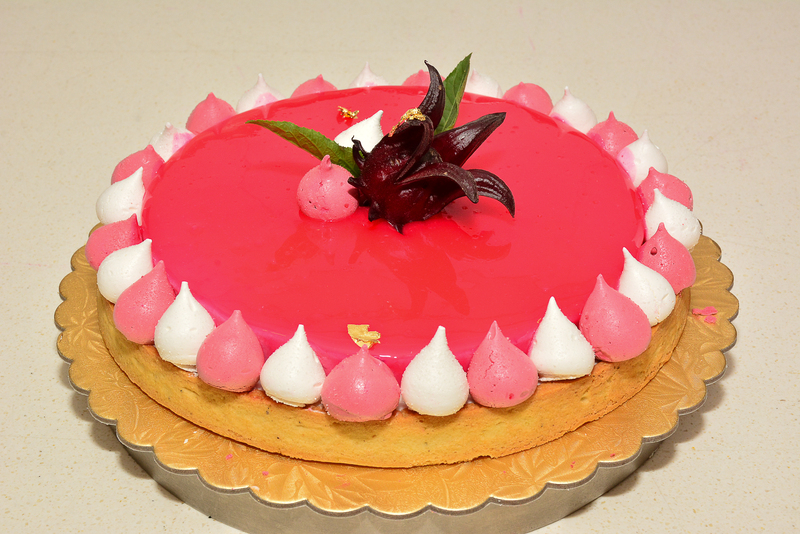 Pose the roselle mousse insert at the centre of the lychee mousse tart then decorate with roselle in syrup. Combine all the ingredients and bring to boil. Process in a blender and keep refrigerated. Heat up roselle puree with invert sugar. Take out from the heat, whisk in the rest of the ingredients and cast into 16cm flexipat. Push in the pain de Gênes disk and freeze. Butter and sugar in an electric mixer bowl equipped with paddle attachment. Process until well blended and add almond powder, eggs and flour.